That's what you can do when your cruise takes you to Carnival Cruise Lines' Mahogany Bay Cruise Center in Roatan, Honduras. The "Magical Flying Beach Chair" takes four people at a time on a six-minute ride directly from the cruise terminal to the line's private beach. Cost: $5 for unlimited rides. Sounds like a good way to eliminate steps, stairs and encounters with anything not "groomed" by the cruise line. If that's your thing, go for it. After traveling to this must-see destination, here's what I suggest. Enjoy the city. 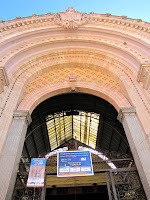 World Heritage Site designations are not given to just any place and you have to walk to truly get the feel of this one. 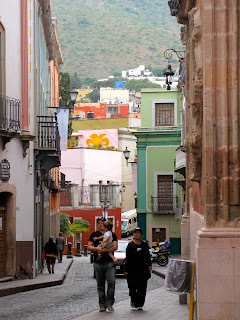 You can taxi from one architecturally significant building to another but it's what's in between that gives Guanajuato its exuberance and character. Where to stay. Can't recommend where my group stayed. 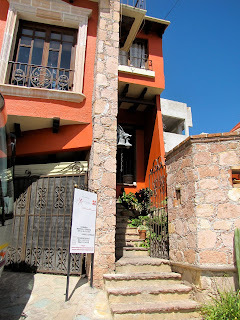 Hotel Guanajuato Mision was too far from the center of town, had too many different levels with no elevator, housekeeping was desultory and the food made several of us sick. A good place to begin researching all elements of this city is Guanajuatocapital.com. Where to eat. 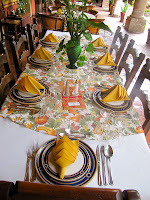 One of the best meals I had in Mexico was at Las Mercedes. Luzma Gonzalez, proprietor and chef, and J. Jesus Cardenas Ramirez have opened their home and Luzma's amazing recipes to the public. My favorites: chicken with --mango mole and the dessert, a corn cake topped with a fruit drizzle and coconut ice cream. Warning: There are stairs and it is in a hilly, residential neighborhood but a meal here will leave you with wonderful memories. International Cervantes Festival. 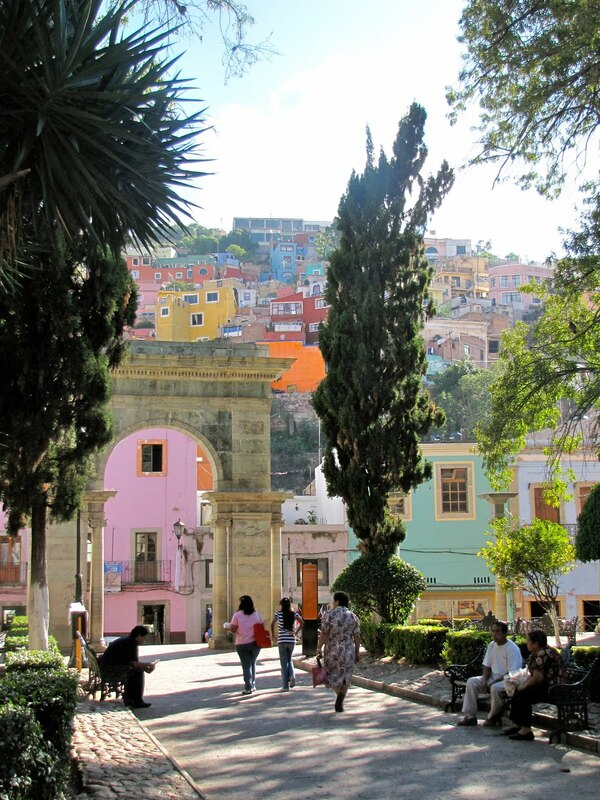 Guanajuato is an arts center and this festival showcases the area's and the world's best artists and performers. In 2009 it ran from Oct. 14 to Nov. 2. I was there for the opening day and it's a kick to be eating dinner and see a costumed Don Quixote stroll by. Tunnels. Much is made of the roadways tunneled under the river and many insisted we should go into them on foot. Don't bother. Too many cars and fumes for comfort. What I'll do next time. 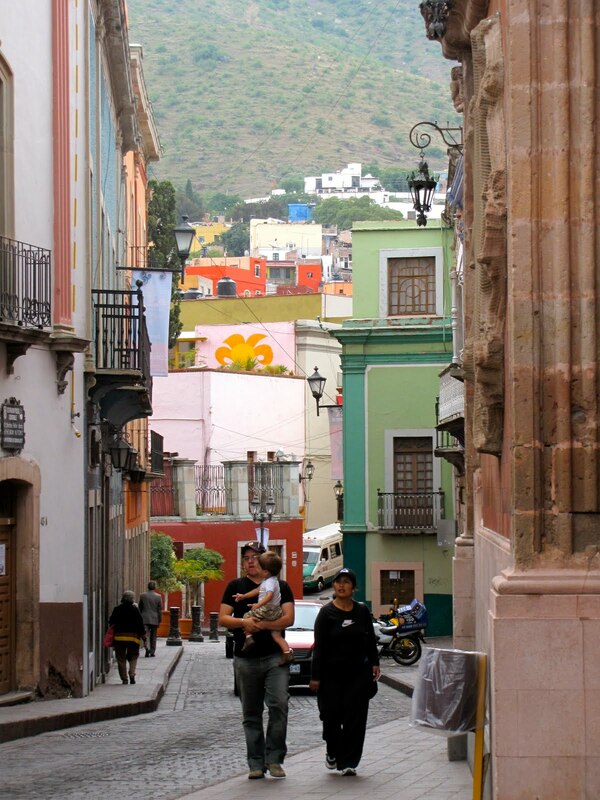 Rest up one afternoon and at night go for a Callejoneada, a traditional parade through the city's alleyways led by musicians and accompanied by tequila to keep spirits high. Eat more street food. It's good, no one got sick from it, it's cheap - four filled up for less than $10 - and fun. Linger longer in the Union Garden. That triangular square canopied by Indian laurels is the center for people watching, cafe idling and concerts. Isn't that reason enough? 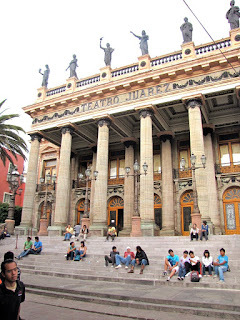 Attend a performance in Teatro Juarez. 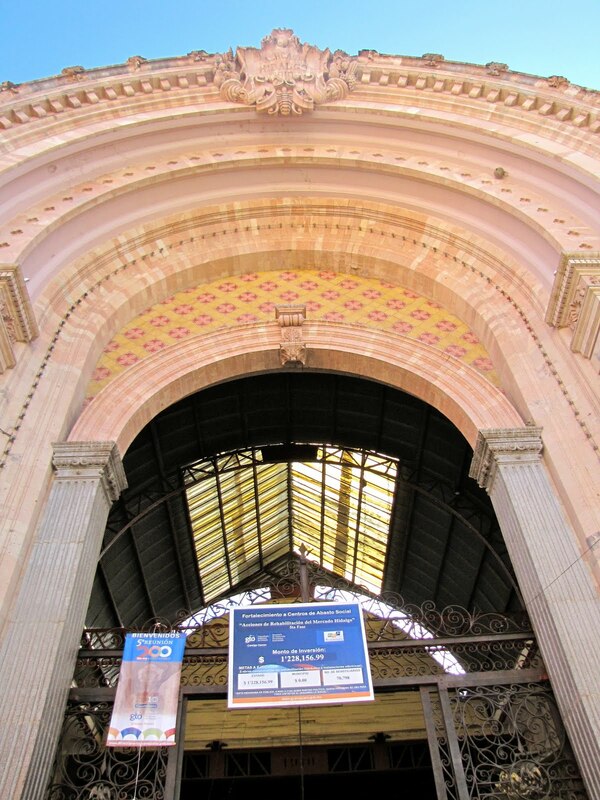 Considered one of the most beautiful theaters in Mexico, it was begun in 1872 and inaugurated in 1903. Lining its rooftop are statues of eight muses; no one seems to know what happened to the ninth. Visit more museums. 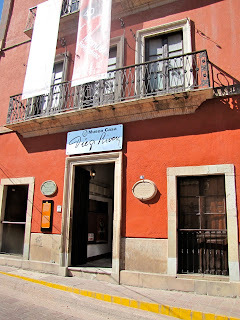 The Don Quixote Museum and the Museo Alhondigas de Granaditas, to name two. Wander more. Visit the churches, poke around the university district, get to know the neighborhoods, the plazas and gardens. Given Guanajuato's streets this will take a few days but I'll try to stretch it as long as I can. Tip: Best Leveler approach is to find a taxi driver who speaks and understands English and hire him for the day. Give him a list of what you want to see, where you want to go and what you want to find. Tell him you want to walk some but not up (or down if it bothers you) steep hills. Between sites when you see an area you'd like to explore, ask him what's there, decide how long you want to or can roam, pick a time and place and have him meet you for the next driving leg. With most taxi trips costing $2-$4, this isn't likely to break the bank. Ask the Department of Tourism for help. 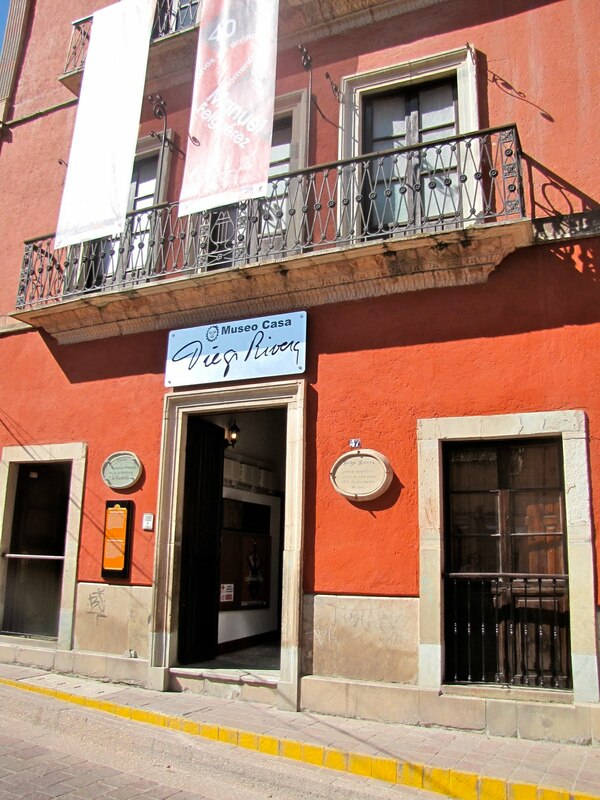 It's across from the Plaza de la Paz, 011-52 (4) 732-9492. Here's a short list of what to see when you travel here. Museo de las Momias/the Mummy Museum. These are not neatly wrapped, beautifully packaged Egyptian mummies, but accidental mummies. Dead people whose families could not, would not or were no longer around to pay for their departed's crypt space. Yes, there's a ick factor, but also fascination and a big dose of reality. Besides, everyone will want to know why you didn't see the mummies if you don't. Tip: There are labels in Spanish and sometimes in English but get a guide who will tell you about the mummified corpses who range from newborn to seniors, rich to poor, peaceful to frightening. You'll have to decide which is worse - the tourists who pulled of bits of mummified flesh for souvenirs (mummies are now safely behind plexiglass) or the prospect of looking like the mummies yourself. 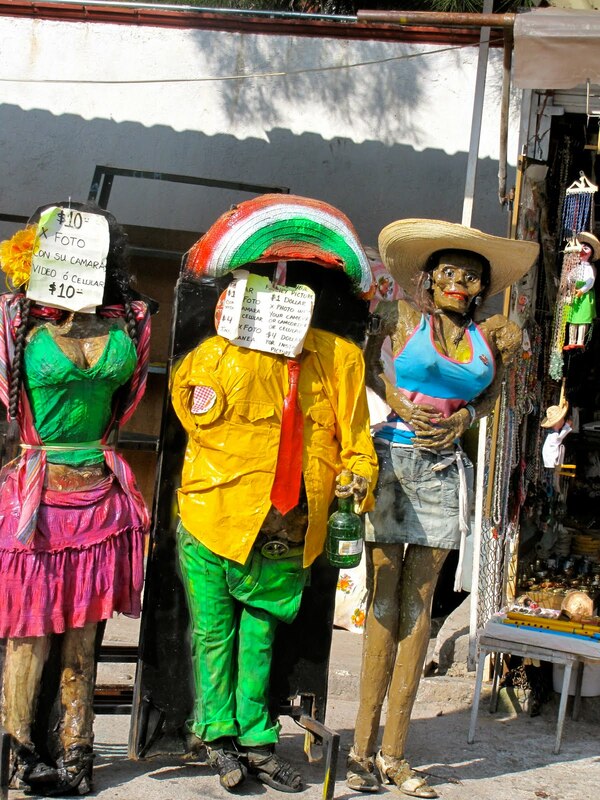 Fortunately, given the Mexican's light-hearted approach to death, vendors outside provide comic relief. Tip: There's a nice banyo - 4 pesos - with an attendant who will make change. Walk around the corner - slightly up hill - and you can see the cemetery where the mummies once resided. 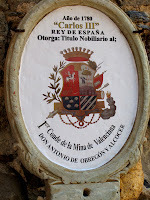 Templo de Valenciana/Church of San Cayetano. 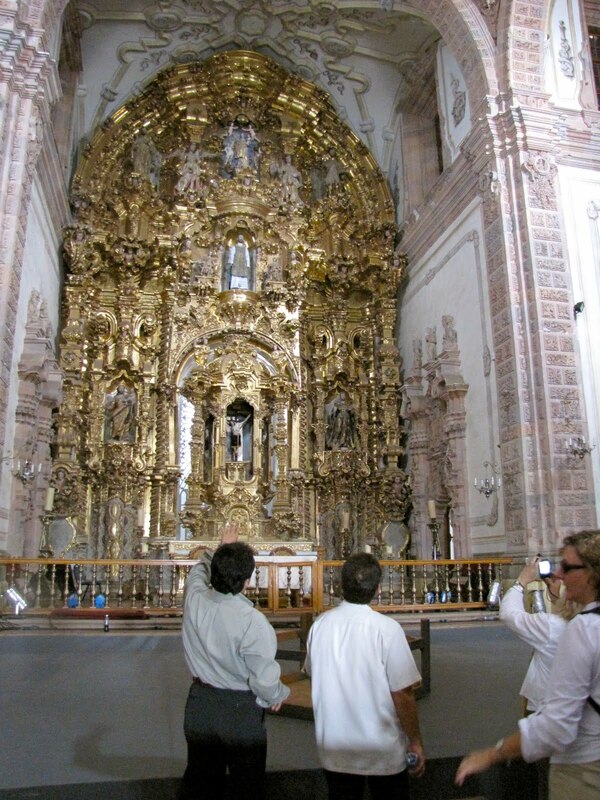 Mexicans put the ultimate flourishes to Baroque architecture, known here as Churrigueresque, especially those such as Don Antonio de Obregon y Alcocer who repaid God's letting him find gold, silver and becoming one of the richest, most powerful men in Mexico by building a church. Tip: You definitely want to take a cab here and you will still have stairs to climb but it's worth the effort. The facade is only a taste of what you'll see inside - 19th century paintings, enough gold gilt to make Midas jealous and incredibly detailed carving. 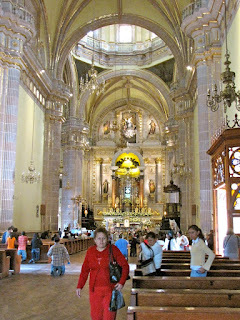 Tip: The basilica and all of the churches here are worth seeing. As you walk by them, slip in and rest a bit. Diego Rivera House. 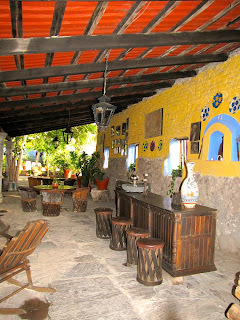 The 18th century boyhood home of Mexico's renowned artist (who married one of its other renowned artists, Frida Kahlo) is preserved as when the Rivera family lived there. In the upstairs galleries are more than 100 of Rivera's works spanning his creative development. Warning: There are stairs but if you enjoy seeing how an artist progresses through various styles this is worth it. 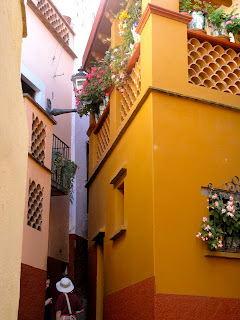 Callejon de Beso/Kiss Alley. Just off the Plazuela de los Angeles, this narrow alley got its name from facing balconies a mere 27 inches apart and the romantic and tragic legend of the two lovers who lived near enough to kiss but too far away for a happy ending. Mercado Hidalgo/Jardin Reforma. Everyone will tell you to visit the Hidalgo Market and it is worth a look, but I'd seen plenty of colorful displays of produce and flowers and other wares already. Tip: The good stuff is upstairs. More enjoyable was the garden square and fountain across the street where the market used to be. Valenciana Mine. You can put on a hardhat and go down it if you want, but I preferred wandering the grounds and sipping a cold beverage in the open-air bar. Its storeroom, which once held dynamite, now is filled with tequila. As one wag said, "What's the difference? Both are dangerous." Even better, the room dedicated to St. San Ramon Nonato. Legend has it if you don't like a neighbor, buy a lock and hang the key from the ceiling to shut their mouth. Don't know if it works but as you can see, a lot of people have given it a try. 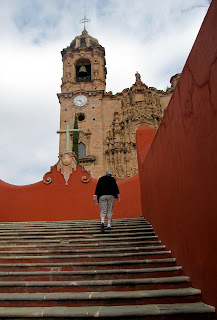 Next, a memorable meal, what I wish I'd seen and suggestions for the flattest way to see Guanajuato. 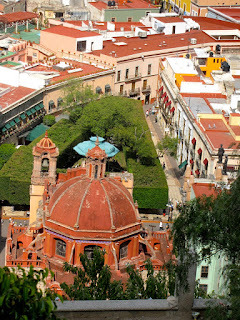 "Hilly place of the frogs" is what the Otomis called Guanajuato. Its silver mines were the "Mother lode" to the Spanish who made it the richest city in Mexico during the 16th century. A challenge is what Levelers will consider its steep hills and winding streets. My new favorite place is the way I think of it. My calves and hip disagreed at the time but they've come around. Tip: Its streets were not made for 21st century transport. Given a choice between bus or car tour, always opt for a car which will get you closer to where you want to be. Wherever you choose to stay and whatever you choose to see, there will be stairs. And hills. Fortunately cabs are cheap so use them to get up the hills, saving your energy to negotiate the stairs. Tip: Don't make reservations at a hotel unless it has an elevator or you have a room on ground level ("ground level" is an oxymoron here). 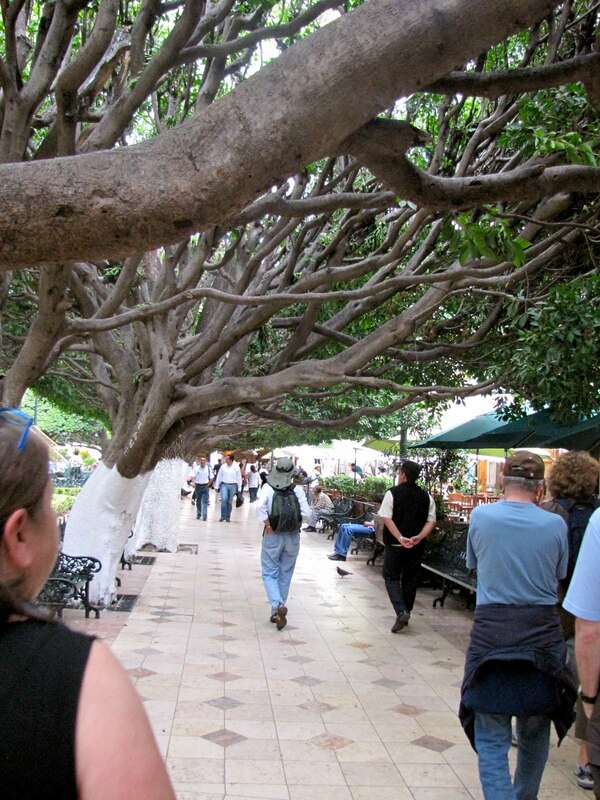 Start at the center of town, the favorite meeting place where the Juarez Theater and the Church of San Diego face Union Garden with its trimmed canopy of Indian laurel. 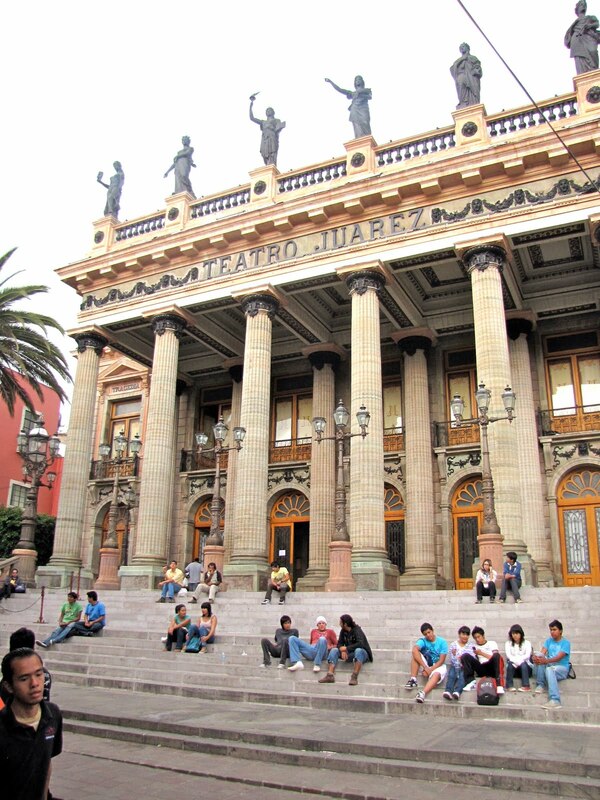 Cafes and restaurants front the garden, mariachi bands stroll and play and students from the university gather on the Teatro steps. It's also flat. Enjoy while you can. That green triangle is the tops of Indian laurel trees. 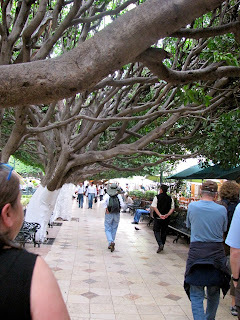 Underneath their canopy of shade is stroll and relax central. Tip: To get a great overview of the city, take the finicular behind the church and theater to the Carretera Panoramica. I highly recommend doing it in late afternoon for the best light although it's pretty spectacular at night, too. You'll have to climb some steps up to the finicular, stand during the ride up and climb more steps up to the overlook but it's worth it. You can't miss the monument to El Pipila, a hero of Mexico's struggle for independence. The Spanish stronghold, Alhondiga de Granaditas, a massive edifice of stone high above the city, was thought to be impenetrable. Pipila volunteered to breach it. He camouflaged himself with a slab of stone, crawled up the hill and set fire to the massive wooden doors. The Mexican army followed and the sanctuary fell. If you can look down into Guanajuato without smiling at its colorful buildings and itching to investigate its winding alleys and streets, plazas and cathedrals, stop because you're in the wrong place. I'll give you reasons to test your goat muscles in the next post! We were probably the only people who traveled to this town without knowing exactly why until we arrived. 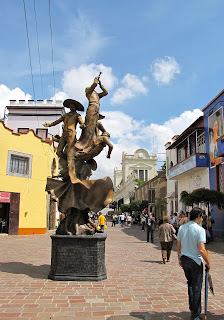 By bus, bicycle or on foot, devoted pilgrims flock to this town to pray to the small statue of at the Virgin of San Juan de los Lagos, known to natives as Cihuapilli, Great Lady. To do so they negotiate steep hills, cobblestones and cracked sidewalks, but the final challenge is ahead. 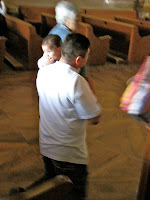 Young and old, the faithful enter the Basilica and proceed down the long central aisle to the altar, on their knees. It is a moving spectacle, an evocation of belief and faith rarely seen north of the border. I couldn't watch very long - my replaced knees ached with sympathy pains - but I'm glad I negotiated the steep hills to see it. The small statue of the Virgin Mary is credited with many miracles. Pope John Paul made his pilgrimage in 1990 and since the 17th century the Basilica has become the second most visited shrine in Mexico. 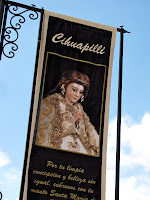 Do make the effort to climb the stairs to the room to the right of the altar where exvotos, expressions of gratitude for Cihuapilli's miracles, are on display. Notes, drawings, locks of hair, toys and other tokens are as fascinating as they are touching. Not so touching are the hordes of souvenir sellers outside who surround visitors with religious knicknacks. Some have stands but the biggest pests are those who carry trays of jewelry and crucifixes right to you. 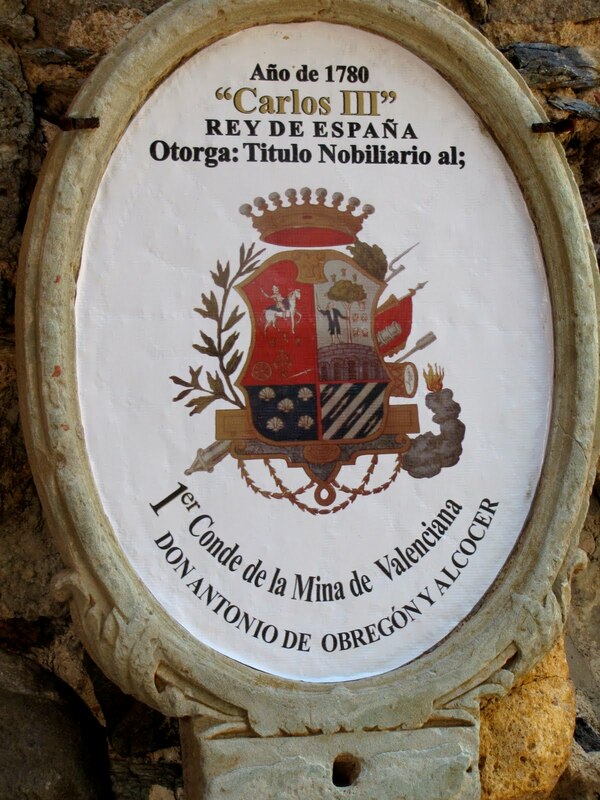 The town exists to serve the millions of pilgrims, especially the crowds that gather between Jan. 12 and Feb. 2, the day when the Virgin is taken outside for a mass procession. It probably wouldn't be worth a special trip for any but the faithful, but if you are heading to Guanajuato as we were, it's well worth the stop. 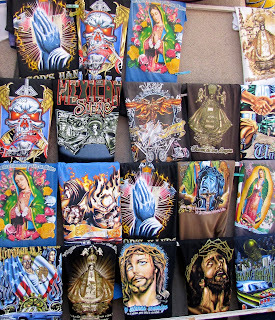 If nothing else, the cultural clash in the juxtaposition of T-shirts, towels, even bedspreads decorated with images of the Virgin, Christ, wrestlers, super hero or cartoon characters are a sure sign you're not in Kansas anymore. 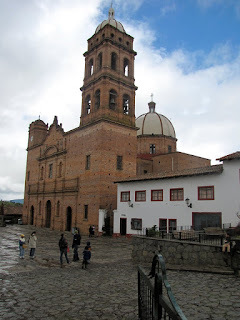 Tapalpa, a "magical" town in the mountains - the description sold me so I signed up for the tour. En route I discovered that "a magical city or town" is one that has hotels and activities for visitors, not necessarily one that is unusually charming or psychic. Keep that in mind as you travel through Mexico. Tapalpa is where Guadalajarans go when heat and work become oppressive, much as Floridians flock to the North Carolina mountains in the summer. The persistent rain dampened much of Tapalpa's charm although the wildflowers at 7,000 feet were spectacular. We drove out to the piedrotes, huge volcanic boulders in what romantics referred to as Valley of Enigmas. They looked interesting, but lashings of rain deterred what could have been idyllic and photogenic rambles. "How did they get there?" we asked our guide. "Volcanoes?" Usually knowledgeable, he shook his head. "Too far away, I think." Later learned they were of volcanic origin, the only explanation for such huge lumps or rock to crop up in the middle of nowhere. Tip: It's about as flat as Tapalpa gets here, so we Levelers could enjoy a walk, weather permitting. 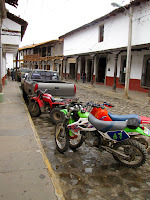 Tapalpa streets are cobblestone, good for photographers but bad for automotive suspensions. ATVs and four-wheel drive trucks are the vehicles of choice. The colonial architecture is appealing and, as almost always in this fascinating state, one finds beauty behind what appear to be plain Jane walls. Fans of extreme sports and mountain hiking will find more to love about Tapalpa than we Levelers can, but if you want a long drive (90 minutes from Guadalajara at least) through the countryside and into the mountains on a pretty day, it's a very scenic choice. Savvy shoppers traveling in Mexico put these two towns, both an easy drive from Guadalajara, on their travel itineraries. Levelers should, too. Both are mostly level but certainly not even. 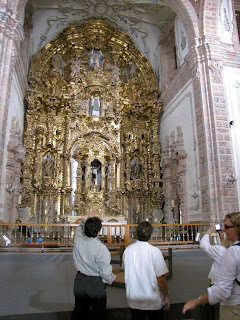 Tip: Remember - don't walk and talk or gawk at the same time anywhere in Mexico. 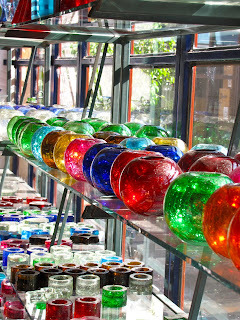 Tonalo is known for its glass blowers, papier mache artists and potters, including the crosshatched, petatilla-style of painted ceramics perfected by four generations of the Bernabe family. 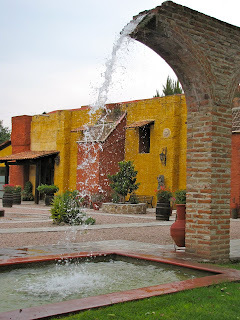 It's a working town - the clay used by artisans in Tlaquepaque comes from here now - and judging by the architecture always has been, unlike its more touristy neighbor where the rich built handsome haciendas where they could escape the city. Pretty is as pretty does, though, and there are bargains to be found in hand-blown glass, pewter, fanciful paper mache creatures or boxes, pottery and other decorative objects. 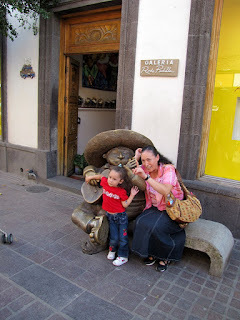 Tlaquepaque (Tla-kah-pahck-ee - fun to say once you get your tongue around it) is where most tourists head and it's easy to see why. Convenient tour bus parking, an easy-to-walk main shopping street lined with attractive restaurants and stores in handsome buildings where the rich once lived that are filled with handicrafts geared to Western tastes. Prices will be a bit higher but the quality and style probably will be more appealing. On the higher end, the famous Mexican artist Sergio Bustamante has a gallery here that features his designs on shoes, handbags, jewelry and scarves in addition to the really high end furniture and sculpture. You'll also encounter the chubbily charming ceramic sculpture of Rodo Padilla. A two- or three-day stay at Hacienda el Carmen is a lovely way to ease into your travels to Mexico. 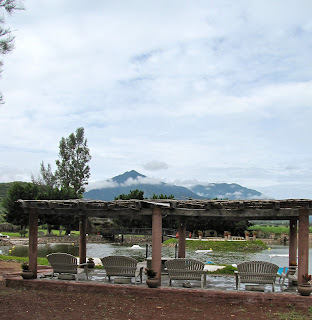 Surrounded by mountains, including Tequila Volcano, the 18th century buildings are in a relatively flat valley. Warning: Flat does not mean level, however. Flagstones settle unevenly, cobblestones are never flat and when you slip 21st century comforts into 400-year-old structures, stairs and steps are inevitable. 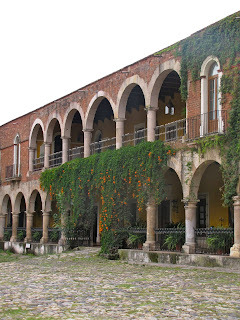 Compared to other places you'll go in Jalisco, though, Hacienda el Carmen is a piece of cake. If stairs are your nemesis, ask for a room on ground level and specify a bathroom that does not require a step up or step down to enter. Developed with utmost respect for the existing walls of what had originally been a monastery and convent plus graineries, stables, even chicken coops, the result is remarkable. Antiques, hand embroidered linens and eye-catching decorative objects, many with historical or family significance, abound. Credit for the decor goes to the elegant Martha Serrano who, as her daughter Monica Baezze says, "is the queen of recycling." 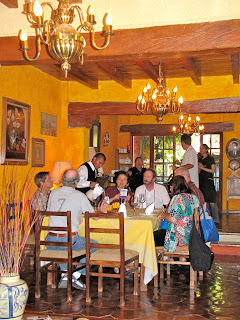 Sugar cane, corn, wheat, citrus and some blue agave are still farmed, primarily for use on the hacienda. You'll find the food here fresh, carefully prepared and attractively presented. You can be as active or inactive as you want here. Within the beautiful grounds there are a pool, stables, bicycles, a rough pitch and putt course and a wonderful spa that has been seamlessly fitted into a former grainery. 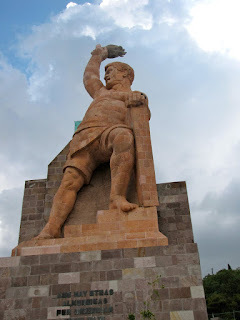 In nearby Teuchitlan is the Guachimontones Archaeological Site, circa 500 A.D., ruins of what once consisted of 18 united ceremonial sites, more than 1,000 complex homes and a population of more than 20,000. There are English-speaking guides on site who can bring the once thriving community and its beliefs to life in your imagination. Tip: Oswaldo did a great job for our group as he guided us through the relatively flat, easily walked site.